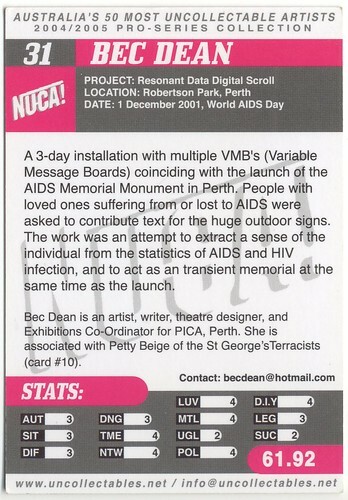 NUCA was founded in 2004 by a group of artists from around Australia. Our first project was the production of a set of collectable swap-cards (“bubblegum cards”) featuring Australia’s 50 Most UnCollectable Artists. You can see all the cards here and here. The cards were a parody of Australian Art Collector Magazine, which each year produces a dubious list of “Australia’s 50 Most Collectable Artists”. 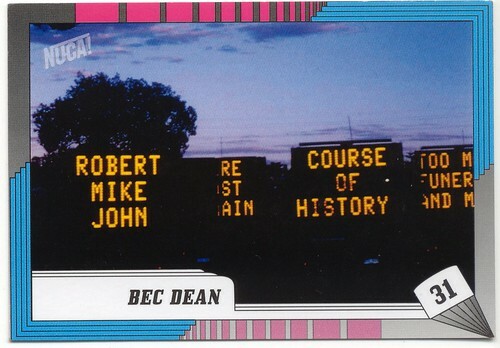 Beyond the prank, our cards documented a range of ephemeral art practices from around the country – practices which usually slip into obscurity and miss out on the chance to enter the history books. Each pack contained 8 randomised cards from the set of 50, and a stick of orange flavoured bubblegum. To collect all 50 you had to swap your doubles with your friends! We launched the cards at the 2004 Next Wave Festival, and continued with bustling launch and swapmeet events in Sydney (MCA, Briefcase Gallery, Cross Arts Projects) and Perth (Artrage Bakery Complex). NUCA was involved with the exhibition Resistance Through Rituals at West Space in Melbourne, 2004, curated by Lisa Kelly. There we launched our UNCO grants, which provided small start-up capital for worthy uncollectable projects. I wrote a small essay for the catalogue of that show, which is reprinted here. 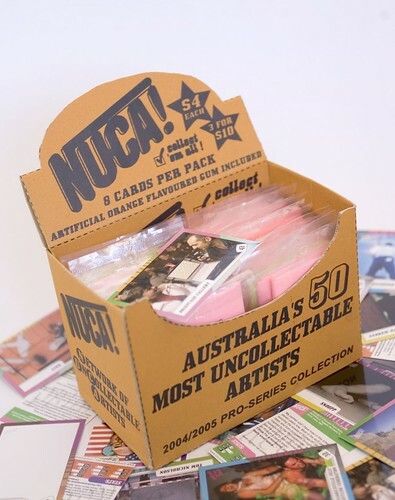 Only 3000 packs of NUCA cards were produced, and all have sold out. The cards are now a rare collector’s item in their own right! (Amusingly, the University of Wollongong purchased a whole box for their collection, and this box of cards has been touring in the exhibition Multiplicity curated by Glenn Barkley and Katie Dyer). 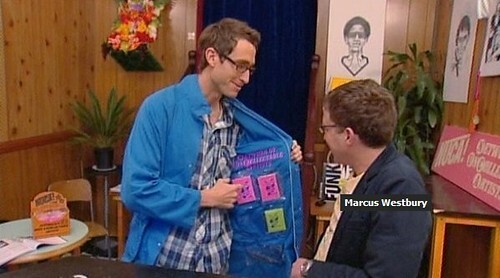 In 2007, the NUCA Bubblegum Cards were featured on Not Quite Art, a TV show by Marcus Westbury on ABC. In 2009, Julia Gwendolyn Schneider wrote an article about NUCA for Austrian art magazine Springerin. NUCA continues to operate as a nation-wide affiliation connecting those who gravitate towards ephemeral projects, participatory experiences, illegal art actions, and activities that oddify everyday life. 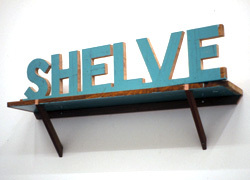 Some members make unwieldy installation projects, while others alter billboards, project images in abandoned spaces at night, or exchange ideas rather than objects. Some simply make dead ugly paintings that would never sell. Because such artworks are often fiendishly tricky to document, they seldom grace the columns of â€œrecognisedâ€ publications. NUCA’ e-list enables artists to exchange essential info about their activities, collaborate on new projects, and connect with Uncollectable others.